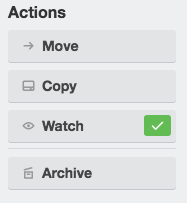 Watching allows you to be notified when another user makes a change to a card, list or board in Trello. You’ll get the same notifications listed above, but for all cards in a list or board. You are mentioned in a comment. You are added to a card, board, or team. You are mentioned in a checklist item. One of your boards is closed. When someone makes you an admin of a board or team. Click the "Watch" button when the card is open. If you are added as a member of a card, you will automatically be watching that card. 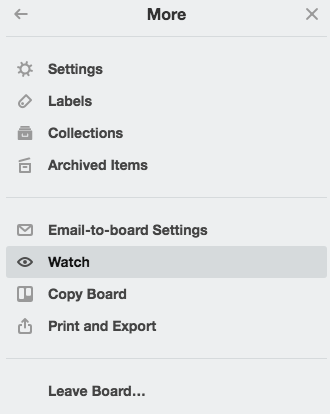 At the top of a list, click on the three dots to open the drop-down menu and choose "Watch." This will notify you of changes to all cards in that list. From the board Menu, choose "More" then select "Watch." This will notify you of changes to all cards in that board. 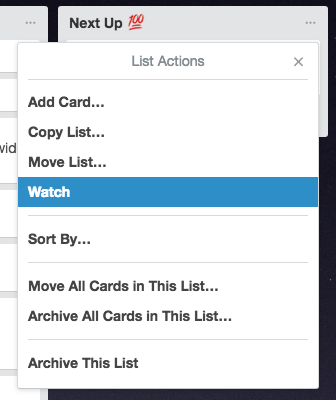 You can also start or stop watching cards, lists or boards directly from within the notifications panel. Just click on the "..." icon beneath the read/unread dot on the left. There, set or remove the checkmark to watch a specific board, list or card. 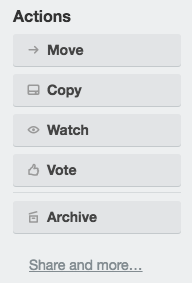 You can easily tell if you're watching a board, list, or card by looking for an "eye" icon. For a board it will be to the left of the menu in the sidebar, for a list it will be next to the list's name, and for a card it will be below the card's title.